GROSSMONT COLLEGE – At an end-of-the-year awards ceremony, Grossmont’s faculty looked forward to improved facilities, back on departed colleagues, and to the present educational budget crisis. The Twelfth Annual Recognition Awards Ceremony on Thursday, May 12, began with President Dr. Sunita Cooke anticipating the opening of administrative and student facilities at the main entrance to campus, and with a moment of silence in memory of such late faculty members as Janice Gervais and Diane Mayne-Stafford. Her comments were echoed by Bill Garrett, president of the GCCCD governing board. Thereupon, Dr. Sue Gonda, president of the Academic Senate, called out the names of faculty members from every department. In a quick-paced ceremony, she presented them with their awards, and they walked outside to have their photos taken. From this student’s perspective, it seemed to be a great ceremony for the faculty and they really enjoyed themselves. GROSSMONT COLLEGE — Funky hairstyles, graceful movements and feeling the Gospel in your body; That is what you can expect from Entrances & Exits by the dance department of Grossmont College. April 14, theopening night, attracted a full house. Students, faculty and parents came to watch an amazing show with The Afro-Cuban Ensemble bringing down the house with its opening act. People were excited to see what was next. The show continued to amaze, providing a repertoire ranging from upbeat tempos, to calm, relaxing melodies that put a smile on your face. It was exhilarating to see students doing what they love and enjoy, which is dance. Entrances & Exits is a well put together production, with eleven unique and tasteful acts including a finale that will have audience members dancing with joy. The show runs till Saturday April 16. If you can’t make it to the show you can order a DVD that will be available May 9. Pre-Order your DVD through Kathy Meyer or David Mullen in the Dance Department. 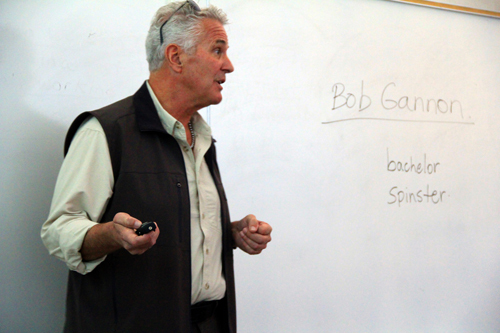 GROSSMONT COLLEGE — Bob Gannon made a visit on March 10 to students studying English as a Second Language at Grossmont College to tell his story about traveling around the world in 10 years. Bob got his pilot’s license in 1992, and soon after embarked on an-around-the world-journey. The bachelor pilot has flown around the world many times. In his first global jaunt from San Diego, he headed east to fly to Paris, France “I figured Lindbergh flew there, why can’t I?” Gannon told students in the class taught by Mimi Pollack. GROSSMONT COLLEGE–For many artists, nature is an inspiration, but for Jim Wilsterman, nature is his co-artist. Wilsterman’s art is being exhibited at the Hyde Art Gallery until February 24. The focus of the exhibit is on the varied effects – the varied impressions – made by raindrops. On display are 24 pieces of his collection of more than 50. GROSSMONT COLLEGE — Imagine yourself in this student’s situation. After some detours and setbacks after high school, this student has finally gotten her act together at Grossmont College. She has applied for and received financial aid, and despite juggling jobs and classes, is academically on track to transfer to SDSU. But a sudden emergency — say, an unexpected auto breakdown, a rent increase, or a job layoff or reduced hours — prevents her from attending class and forces her to consider dropping out of college entirely. It is just this kind of scenario that is tailor-made for Dreamkeepers — a new program funded in part by the Grossmont College Foundation (GCF). 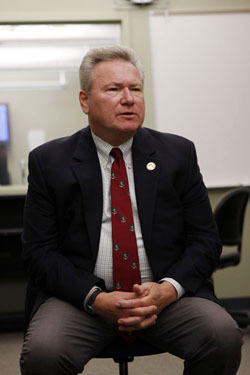 What the GCF does for Grossmont students was the main focus of a press conference that the organization’s executive director, Ernie Ewin, held for MCom132 students on December 7. Funds raised by the Foundation from the community then are awarded to meet college needs as envisioned by Grossmont President Sunita Cooke and Grossmont faculty, including Funds that have been allocated for such expenses as general supplies, equipment, and travel support for events that augment students’ experiences at college. Ewin stated that the Foundation is “more or less trying to do the things that normally you see colleges doing that you do not see because of budget constraints” due to California’s fiscal crisis. Part of the Foundation’s fundraising will go towards a $20,000 pool of money each semester that is meant to help students in short-term emergency situations. Grossmont is one of four colleges in that the state of California that are participating in the nationwide Dreamkeepers program, which is funded in part by the Kresge, Lumina and Wal-Mart foundations. Some Grossmont students were helped this semester by Dreamkeepers grants, which can be $500 or less. Information and application forms for these grants is available at the Grossmont financial aid office, according to Ewin. The Grossmont College Foundation is also engaged in aggressive fundraising to increase the number of Bernard Osher Foundation scholarships awarded to Grossmont students. Currently the college awards thirteen $1000 scholarships to Grossmont students; the goal is to raise this number to 42. The Grossmont College Foundation is also working to improve its community outreach and alumni networking, Ewin stated. These changes include a major revamping of its website to make it more interactive and social; the new web site will launch sometime early in 2011. As a former student body president of Grossmont College, Ewin says he wants students to succeed in their school endeavors, and to help them hurdle the road blocks they may encounter on the way to success. Discussing his own life experiences, Ewin, currently a member of the La Mesa City Council, said he knows there are times in a student’s life when paying for school is difficult and could thus cause a student to drop out.